(Phys.org) —The first set of high-resolution results from ESA's three-satellite Swarm constellation reveals the most recent changes in the magnetic field that protects our planet. 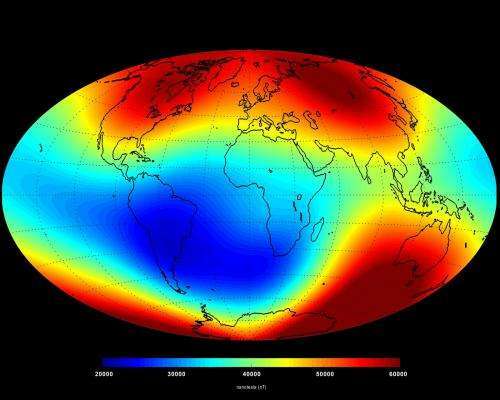 Launched in November 2013, Swarm is providing unprecedented insights into the complex workings of Earth's magnetic field, which safeguards us from the bombarding cosmic radiation and charged particles. Measurements made over the past six months confirm the general trend of the field's weakening, with the most dramatic declines over the Western Hemisphere. But in other areas, such as the southern Indian Ocean, the magnetic field has strengthened since January. The latest measurements also confirm the movement of magnetic North towards Siberia. These changes are based on the magnetic signals stemming from Earth's core. 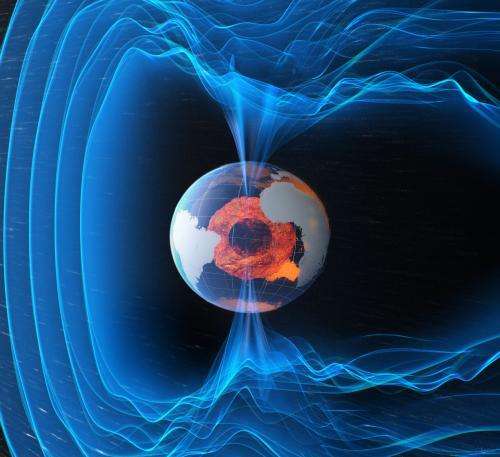 Over the coming months, scientists will analyse the data to unravel the magnetic contributions from other sources, namely the mantle, crust, oceans, ionosphere and magnetosphere. 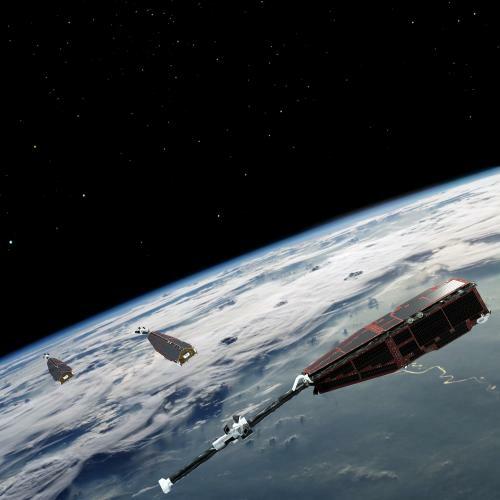 "These initial results demonstrate the excellent performance of Swarm," said Rune Floberghagen, ESA's Swarm Mission Manager. "With unprecedented resolution, the data also exhibit Swarm's capability to map fine-scale features of the magnetic field." The first results were presented today at the 'Third Swarm Science Meeting' in Copenhagen, Denmark. Sofie Carsten Nielsen, Danish Minister of Higher Education and Science, highlighted the Danish contribution to the mission. Swarm continues the legacy of the Danish Ørsted satellite, which is still operational, as well as the German Champ mission. 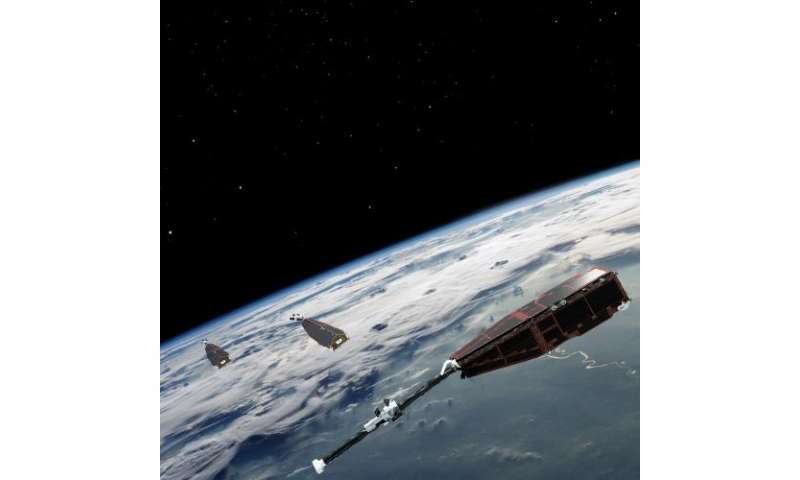 Swarm's core instrument – the Vector Field Magnetometer – was provided by the Technical University of Denmark. Denmark's National Space Institute, DTU Space, has a leading role – together with 10 European and Canadian research institutes – in the Swarm Satellite Constellation Application and Research Facility, which produces advanced models based on Swarm data describing each of the various sources of the measured field. "I'm extremely happy to see that Swarm has materialised," said Kristian Pedersen, Director of DTU Space.